Greetings, and welcome to Axios Space. I'm Miriam Kramer, your cosmic travel guide each Tuesday. Please send your scoops, tips, questions and alien abduction stories to miriam.kramer@axios.com, or just reply to this newsletter. 🚨Situational awareness🚨: There's a major discovery being announced tomorrow from the Event Horizon Telescope — tasked with photographing a black hole for the first time. Follow our coverage. Instead of just two superpowers — the former Soviet Union and the United States — battling it out for supremacy, there are myriad players aiming for the moon these days. China, India, a nonprofit from Israel and a number of private spaceflight companies are all working to launch (and land) their spacecraft on the moon. The big picture: Many of these new moon missions are aimed at turning our natural satellite into a base for pursuing deep space missions. 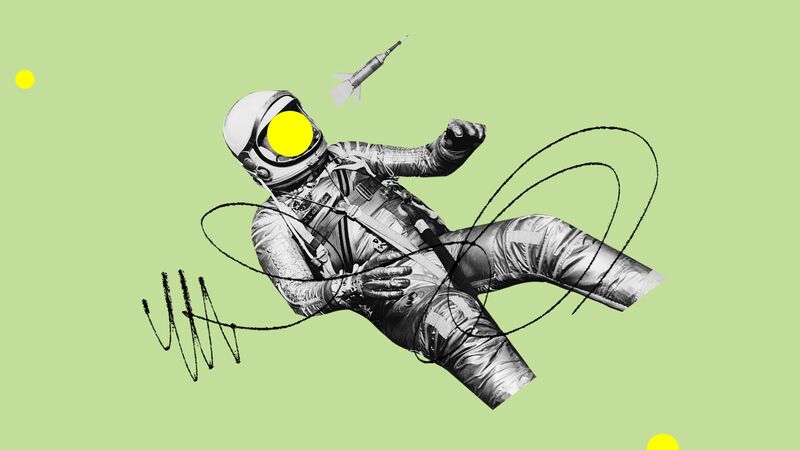 "Today, science and status compete as the reasons to go to the moon, replacing the Cold War motivations that ruled the Apollo approach," space historian Robert Pearlman tells Axios. "There is a new focus on sustainability and reusability, but also an overall sense that the moon is only a stopover on the way to Mars, rather than the ultimate goal as defined by President John F. Kennedy in 1961." NASA's plan to get people to the moon by the mid-2020s, for example, is exceedingly ambitious and not yet fully funded. A new space weather model under development at Los Alamos National Laboratory could help give a 24-hour warning before a storm of charged particles from the sun bombards crucial satellites, potentially knocking them out of service. The big picture: These "killer electrons" move more erratically during solar storms — a type of space weather where particles from the sun smack into Earth's magnetic field — so being able to predict that variability is key for spacecraft operators. If this model — which is still in its testing phase — lives up to its promise, it will give mission controllers the time to either get their satellites out of harm's way or temporarily shut them down before the electrons hit. "These electrons are highly penetrating because they have really high speeds, very close to light-speed," Yue Chen, one of the scientists who helped develop the model, tells Axios. "So, they can easily penetrate the shielding of the satellites, and they can bury themselves inside the electronics." Chen is the lead author of a new study detailing the model in the journal Space Weather. How it works: The model uses satellite measurements from a Department of Energy satellite and a weather satellite from NOAA to predict the erratic motions of these potentially harmful electrons. The bottom line: If scientists can figure out how to better predict these kinds of events, we can protect satellites from "killer electrons" and the havoc they can wreak. However, there are still other space weather hazards that satellite operators will have to contend with. A new telescope instrument saw first light on April 1, a step toward untangling the mystery of dark energy — the invisible, mysterious force thought to drive the expansion of the cosmos. The big picture: The instrument, called the Dark Energy Spectroscopic Instrument (DESI), is made up of six large lenses that — once they're fully operational — are expected to help astronomers measure the distances between galaxies in order to clock the expansion of the universe propelled by dark energy. "DESI is the greatest cosmic cartography experiment we've ever done," Arjun Dey, staff astronomer at the National Optical Astronomy Observatory in Arizona said in a video. "So we're trying to map out where all the galaxies are in the universe out back in time for the last 12 billion years of its history." DESI's first task was to take a look at the Whirlpool Galaxy, located about 31 million light-years away. This target was chosen as a test to be sure that the lenses were functioning as expected. How it works: The light taken in by the telescope will be broken up into thousands of colors, allowing scientists to figure out the distances to those galaxies and how quickly they're moving. Astrophysicist Tamara Davis tells Axios that DESI can measure 5,000 galaxies at a time. "By mapping the universe this way, we can measure its expansion rate and how large structures (galaxies and clusters) grow within that expansion. Since these depend on dark energy and dark matter, it means we will be able to measure the properties of the dark components of our universe with unprecedented precision," she says. What's next: By the end of the year, DESI should be able to measure galactic distances by looking at thousands of light sources instead of just one big picture of the sky. NASA could soon use an artificial intelligence-fueled fix for a malfunctioning instrument on its Solar Dynamics Observatory, which observes solar activity in extraordinary detail. Why it matters: Powerful solar storms — bursts of solar plasma and charged particles — can harm satellites in orbit and even cause major problems for power grids on Earth. And the SDO, which can spot solar storms in real-time, is a key part of that. What they did: The SDO instrument in question is known as MEGS-A, and it was designed to keep an eye on ultraviolet radiation levels, which correlate with a ballooning of the Earth's outer atmosphere that can harm satellites in near-Earth orbit. A deep-learning network that IBM created in 2018 may soon replace the failed instrument by inferring what ultraviolet radiation levels that instrument would detect based on what the other instruments on SDO are observing at any given time, NASA AI consultant Graham Mackintosh tells Axios. "Imagine you've got an orchestra playing, and at some point, for some reason, partway through, one of the musicians playing the violin just stopped and walked off. Could you know enough about the way that music was playing to fill in the gap and re-create what you think that musician would have played if that musician was still sitting in the chair? That's sort of what we did." While NASA isn't yet using the fix operationally, the results are promising, Mackintosh added. What to watch: AI models like this could also be used for other future missions, Mackintosh said. Instead of loading three instruments on a satellite to measure different aspects of the space environment, you could potentially launch two and use the data collected to infer the information that would have been measured by a third. 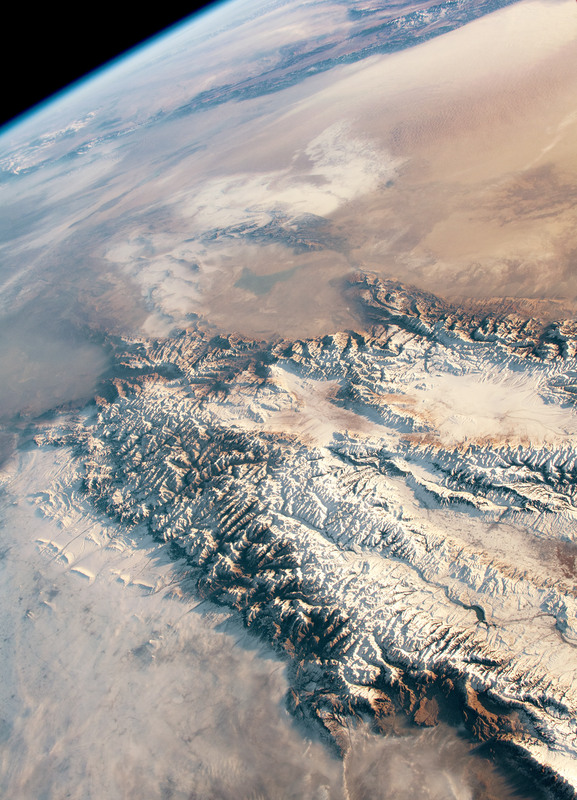 This photo, taken from the International Space Station in December 2018, shows the Tien Shan mountain range in central Asia. "The Tien Shan hold many of Asia’s major glaciers. In the spring and summer, the melting of ice and snow replenishes local rivers and transports eroded sediment to valleys," NASA states on its Earth Observatory website. The full image (which is definitely worth gazing at) also shows the Taklimakan Desert next to the snow-covered mountain range. This photo proves yet again that Earth is the best object to check out from space.